As you would expect, many different infographics appeared about the FIFA World Cup 2014 edition held in Brazil. This is definitely a sporting event that is incredibly popular and that has millions of people watching. It is a sports event that is held once every 4 years to decide who the best soccer team is and it always stands out as it is covered by media from all around the world. In order to understand the popularity of the event, it is enough to mention that over 715 million people watched in 2006. More are expected to watch in 2014. The infographic offers so many interesting stats that we should know about. In order to properly organize the FIFA World Cup 2014 event, 15,000 volunteers were employed. There are 64 matches that will be played and 32 teams that will participate. 12 stadiums from Brazil will have matches with some of them being Rio De Janeiro, Brasilia, Porto Alegre and Recife. Brazil, the current host of the World Cup, managed to win the World Cup 5 times in the past. This makes it the most successful team ever. They are also among the favorites for this edition. However, many other teams like Germany or Uruguay have strong chances of making a very good showing. No matter what team you support, it is a guarantee that you will enjoy the FIFA World Cup even more after you take a look at this infographic. It was created by an Australian site, Home Away. It does talk about the Australian team but also highlights various other stats of extreme interest. 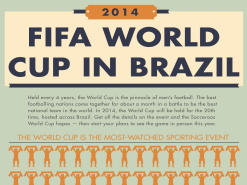 Take 5 minutes from your surely busy daily schedule and look at all the stats highlighted in the infographic about the FIFA World Cup in Brazil. You will surely find out some interesting things that you had no idea about. After all, this is why people create infographics, no? Just make sure that you do not skip over elements as every single section is really interesting. It is not at all difficult to go through such a well created infographic. If you have extra stats that we should know about, why not comment? We always love to learn new things about anything, including the World Cup. This wonderful event will be tremendous and it is a guarantee that many incredible moments would be created during this year’s event. Why not be a part of them while being really well prepared?